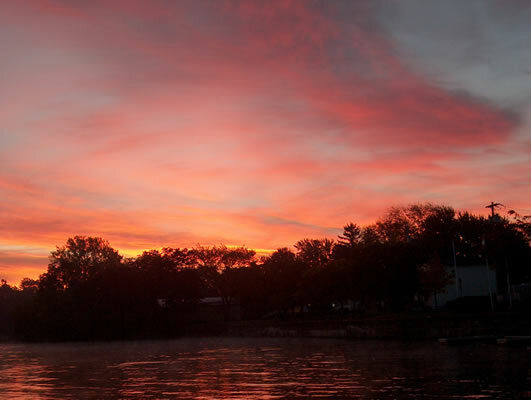 The morning sky streaked red. Still in their pjs the grandchildren, rubbed the sleep from their eyes, rushed out onto the deck, baited their hooks, dropped their line, and watched the sun greet the day. Patiently they waited for that slight tug on the line indicating that, indeed, there are fish in the Erie Canal. Nearby a great blue heron taunts them by making the first catch of the day. 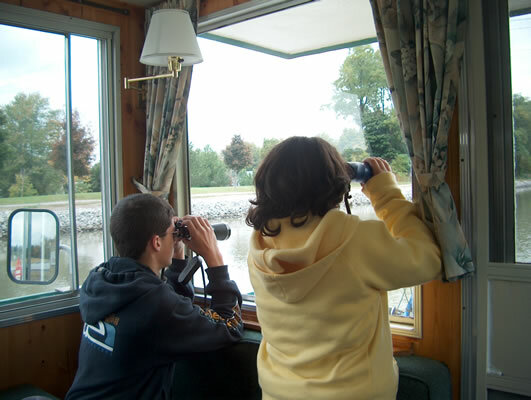 Houseboating on the Erie Canal is the perfect multi-generation vacation, It turns a fun vacation into a learning adventure. You don’t need your own boat to enjoy life in the “past lane.” Rental houseboats make it possible for all vacationers to relive the old canal days. Heading east from Tonawanda, near Buffalo, NY, there are miles of scenic shoreline providing plenty of time to become accustomed to operating the boat before “locking through.” If you can drive a car you can drive a houseboat. It is impossible to get lost on a canal, and at a maximum of speed of 5 miles an hour boating in the shallow canal means the potential problems are minimal. Yet the adventure and learning opportunities are unsurpassed – for all ages. 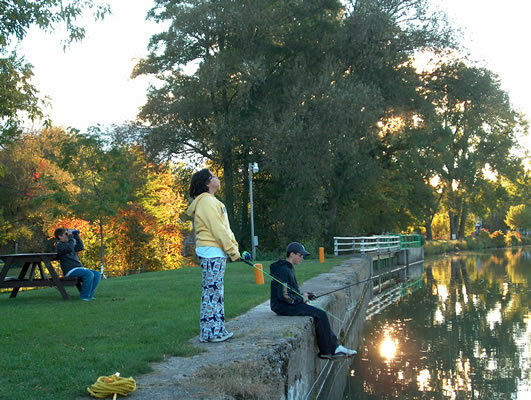 Locking through the historic locks in Lockport is a hands-on lesson in canalling that young and old will always remember. When the massive water gates open and all hands are ready, the captain eases the boat into the lock to a cable on the side of the wall. A crewmember, on our trip it was 13-year old John, leans out the window and hooks the rope around the cable. When all is secured, the water gate is closed, the water pumped out, and in five minutes the boat is 25 feet lower. The rope that slides down the cable as the boat is lowered is unhooked and the captain motors into the next lock where the process is repeated. The Lockport locks are unique on the Erie Canal in that there are two together. 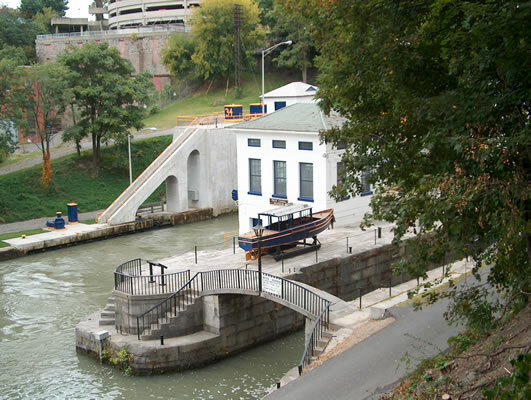 It was an early 20th century upgrade replacing the earlier “flight of five,” the remains of which can be seen next to the working locks. We celebrate a successful locking through by taking “shore leave” to tour the Lockport Cave and take a another boat ride, this time on an underground river! A new history lesson. We’ve all heard of Thomas Alva Edison but who has heard of Birdsell Holley. We see one of his many inventions every day - the fire hydrant. The only person in the United States who held more patents than Birdsell was his close friend, Thomas Edison. The tour starts with a brief history of the canal and locks, then visitors enter the water tunnel in the side of the hill which looks like a place where no man, woman or child should go. “Cool! Very cool!” comment the grandchildren. The Lockport Cave is actually a 12 x 20-foot man-made hydraulic raceway blasted out of solid rock over 140 years ago. At one time the water that raced through the tunnel provided power to three factories. The tour includes a ½-mile underground boat ride. It is historical. It is educational. It is fun. Truly a unique experience! 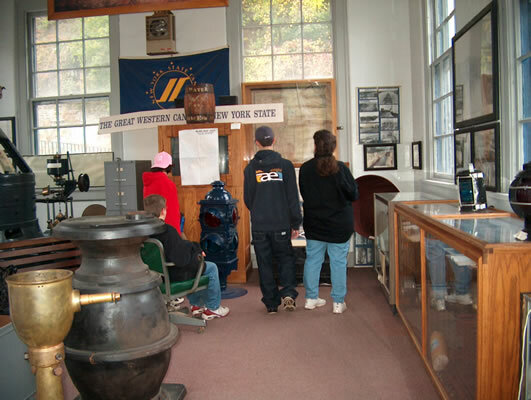 Before heading back to the boat, we learn more about the canal following the signs on Riley’s Way, a canal walking tour, and at the canal museum located between the remains of the old “flight of five” and the current locks. “Low Bridge, Everyone down” is still an appropriate cry as almost all canal communities between Lockport and Rochester have at least one lift-bridge. 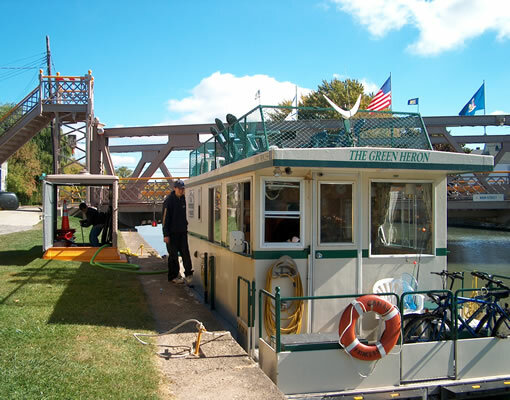 The lift bridges are too low for our boat, the “Green Heron,” to pass under so 12-year-old Elizabeth contacts the lift-bridge operator by radio. “You are welcome, Captain. Have a good trip.” And on we go to the next lift-bridge. Many of the canal towns have newly-created canal parks that provide free electrical and water connections. We tie up late afternoon so there is plenty of time for a bike ride, fishing, or visiting a local attraction before dinner. Some of the towns have museum or other attractions. In Holley, a newly created trail winds through the woods to beautiful waterfalls, and nearby we watch the salmon struggling to get up stream. The days past in timeless relaxation. We spend an hour watching a blue heron play a game of almost-tag with our boat. Regally perched like a centurion on the rocky shore he waited until our boat was within 20 feet, then spread his magnificent wings and glided down to his next sentry post. The green areas along the canal provide perfect habitat for birds and mammals.